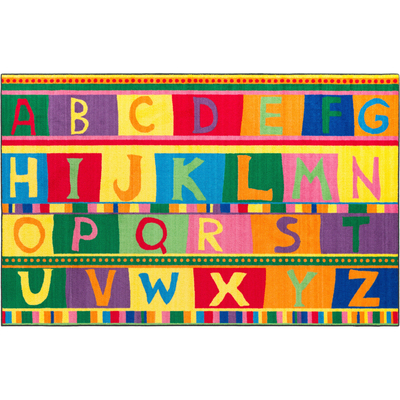 Educational Rug Provides A Visual Reference That Can Be Used Again And Again For Games And Activities. Large, Bold Letters In Various Colors Help Children Recognize Letters, Colors And Visual Differences. Robust Construction Allows Multiple Display Options To Use On The Floor Or On The Wall As A Visual Aid. Skid-Resistant Backing Prevents The Rug From Sliding On Smooth Surfaces For Increased Safety. High-Quality Print Is Manufactured At 625 Dpi For Crisp, Detailed Images With Excellent Definition And Clarity. Highly Durable Design Is Bound And Double-Stitched With Nylon Edge Yarn For Reliable Strength And Sturdiness. Antimicrobial Treatment Helps You Maintain A Germ-Free Environment By Guarding Against Odor, Mildew And Mold. Scotchgard Protector Resists Heavy Soils To Quickly Clean The Rug In The Event Of An Accident..
Educational Rug Provides A Visual Reference That Can Be Used Again And Again For Games And Activities. Large, Bold Letters In Various Colors Help Children Recognize Letters, Colors And Visual Differences. Robust Construction Allows Multiple Display Options To Use On The Floor Or On The Wall As A Visual Aid. Skid-Resistant Backing Prevents The Rug From Sliding On Smooth Surfaces For Increased Safety. High-Quality Print Is Manufactured At 625 Dpi For Crisp, Detailed Images With Excellent Definition And Clarity. Highly Durable Design Is Bound And Double-Stitched With Nylon Edge Yarn For Reliable Strength And Sturdiness. Antimicrobial Treatment Helps You Maintain A Germ-Free Environment By Guarding Against Odor, Mildew And Mold. Scotchgard Protector Resists Heavy Soils To Quickly Clean The Rug In The Event Of An Accident.